A Rinkya Blog: Cute Plastic Bag Dispenser from Japan! 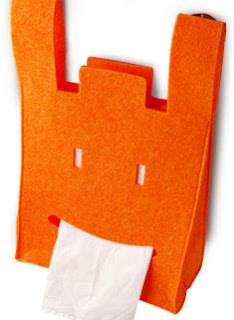 This colorful, smiley bag dispenser comes in 5 different colors (orange, yellow, beige, red and brown). The bag is made from recycled plastic bottles and will hold your plastic bags from the supermarket. In Japan, it is much more common to reuse the plastic bags from the stores if you do not have your own bag to bring. It is also common to make these everyday items kawaii!